1. Make sure to use room temperature ingredients. Leave your cream cheese out for about 1 hour before using it. This will ensure that all of your ingredients blend evenly and smoothly. 2. Beat cream cheese until smooth and creamy before adding anything else. 3. Obey the order of additon: always beat the sugar into the cream cheese first. The sugar is abrasive and will help to break down any lumps in the cream cheese, making sure that it is beyond smooth. Scrape the sides of the bowl with a rubber spatula to ensure everything is getting mixed, and mix until you see absolutely no clumps and it is the most beautiful smooth sea of cream cheese you’ve ever seen. 4. Do not over-beat the eggs into the batter. Use medium speed to incorporate eggs because mixing too much at this stage will incorporate a lot of air into the batter, which will cause it to crack during baking. 5. Absolutely use a water bath! 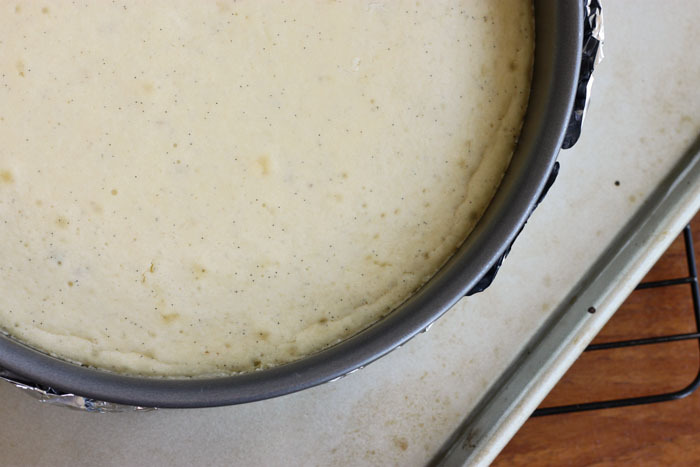 This will ensure even heating all around the pan and create a moist environment - a common reason for cracks in cheesecake is that they dry out. All you need to do is find a dish or rimmed baking tray large enough to fit your spring-form pan into. 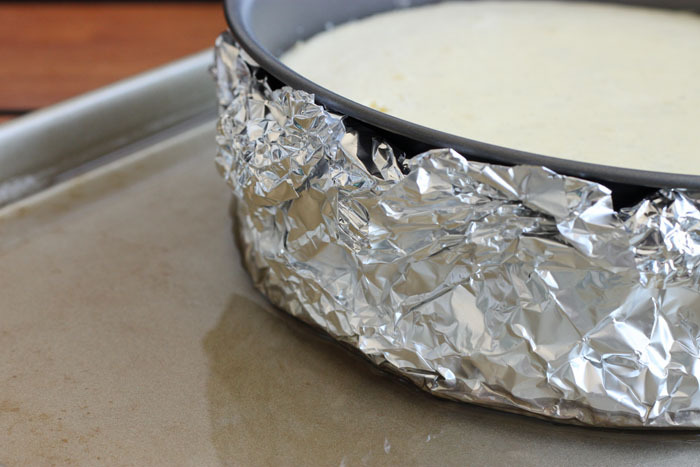 Wrap the bottom and sides of the springform pan with two layers of aluminum foil, making sure that it comes at least halfway up the sides. 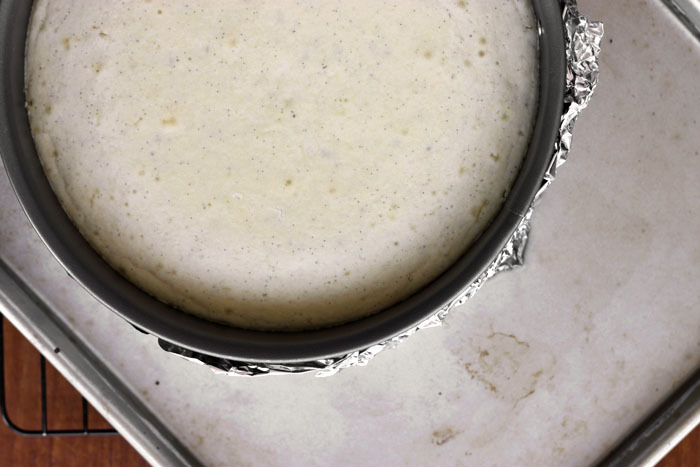 Place the pan in the baking tray and fill it with about 1/2 inch of boiling water when you start baking the cheesecake. 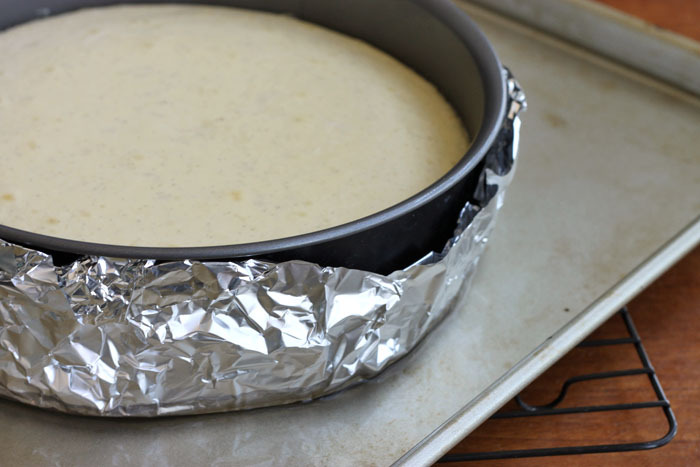 This will regulate the temperature better and humidify your oven to ensure a more uniform baking, as well as prevent cracks from forming in the top of the cheesecake. 6. Bake only until the sides are set and the dead center jiggles slightly when the pan is shaken. It will continue to set as it cools, and guarantees that you won't end up with a dry cheesecake. 7. Let the cheesecake cool completely and then refrigerate for at least 2 hours. It will become dense and creamy and taste like heaven. To achieve clean slices, have a bowl of very hot water next to you as you cut the cheesecake. Before each cut, dip your knife into the hot water and shake off any extra water. I believe this puts you on the right track to building one heck of a dense, creamy, luscious cheesecake! What a post! That could help me from worth case scenario, because it's almost every time, that the cheese cakes cracks for me. Thank you so much and have a wonderful day? How deep does the water bath need to be for each type of cheesecake? Taller cakes would need a higher water bath or do they not require that? Just a 1/2-inch to 3/4-inch up the sides of the pan works fine. You just don't want the water to dry out during baking. Is that vanilla bean I see in your cheesecake? As someone who makes about 5 cheesecakes per week for a friend's restaurant, I have developed my own streamlined process. I always mix my cakes in the food processor. I put everything but the eggs in, process until smooth, then add the eggs and pulse a couple of times to blend. I also never use a water bath. I use the method of baking at a high temp for a short time (450 degrees for 15 minutes), then drop temp to 250 until just set, then cool in the oven with the door cracked open for an hour. The only time mine ever crack is if I get distracted and leave the oven on for a few too many minutes. Using the food processor mixes the batter from the bottom, which reduces the amount of air bubbles, leading to a lower risk of cracks. I've found that I can even cheat and use ingredients that are still a little cold using this method.